On January 19, 2009 Freya Hoffmeister got in her kayak (with a rudder) to begin what is considered to be one of the most challenging trips in the world of sea kayaking. After 332 days, 245 paddling, 13 nights afloat and 5 time zones, Hoffmeister became the first women to circumnavigate Australia on December 15 2009. On June 24 Freya will be here in Charleston at the Terrace Theater on Maybank Highway at 7:00 pm to share her trip with us. Tickets are $20 and are for sale ahead of time. Please call Coastal Expeditions 843-884-7684, with your credit card ready, to purchase tickets. Please join leaders Larry Lynch and Sandy Beasley for an Ogeechee Audubon bird walk through the grounds of the Savannah-Ogeechee Canal Museum and Nature Center on Saturday, May 22. Our primary targets will be the "swamp warblers", including Prothonotary, Hooded, Common Yellowthroat, Northern Parula and maybe a Swainson's if we're EXTREMELY lucky. We'll also be on the lookout for cuckoos, raptors and other breeding birds. The group will assemble at 8:00 a.m. at the Ride-Share lot on the northwest corner of the intersection of I-95 and Route 204 and proceed from there to the Canal. Alternatively, participants may meet the group in the Canal parking lot at 8:15 a.m. There is a $3 per person admission fee to the property (Canal Society members are free). The trip is open to the public. Bring $3 cash, binoculars, water and snacks, sun and insect protection and shoes that can get damp/muddy. 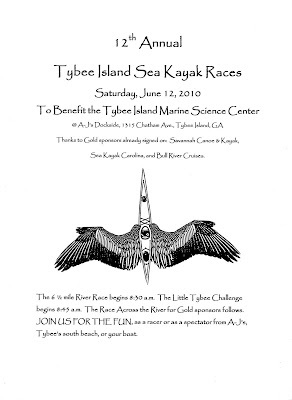 June 12th is, of course, the Tybee Kayak Races, but it is also the second day of the World Cup. On this already auspicious day, we see England squaring off against the USA. Kick off is at 7.30 GMT.. so pretty much straight after the Tybee Races, which usually wrap up around 1pm. Now we just need to find a suitable pub for viewing. If England was up against the women's US team, I would say they would be in trouble, but the men's team should be an early invitation to the next round.. or maybe the next biggest humiliation since the Revolutionary War. Compulsive viewing indeed. While out walking in Bonaventure and Forest Lawn cemetaries, Joeys old stomping grounds, we came across this epitaph on a soldiers grave. 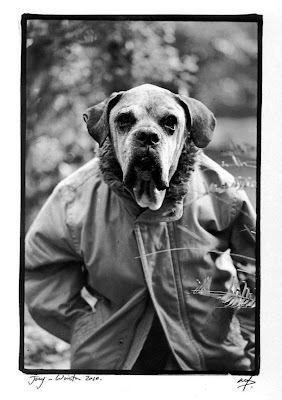 Joey's ashes will be scattered to the four winds in several locations on the planet. 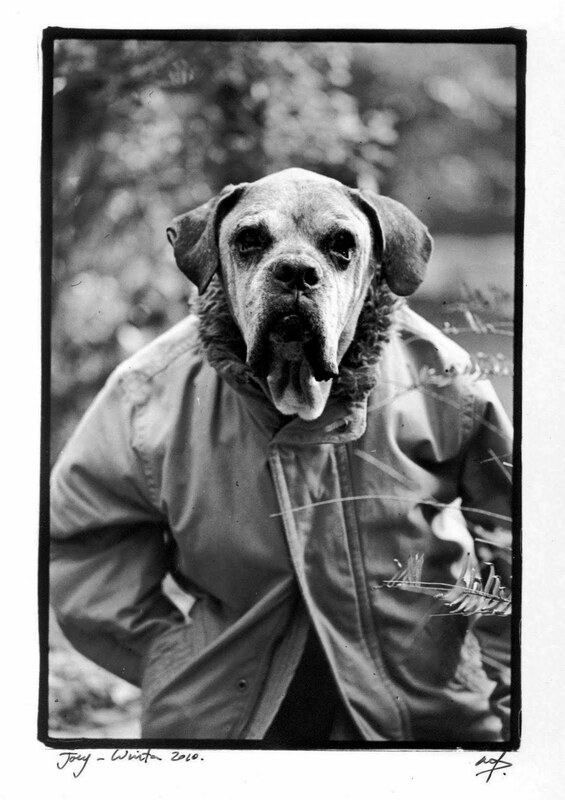 If you are interested in a copy of the above picture please drop us a line. Whether you are looking for a physical workout or just a paddle and chin wag, the Wednesday Paddle Session is back on. Meeting at Desposito's on the Wilmington River at 5.30 followed by refreshments in the bar at 6.30.
round table of sausage dogs. Hope the rest can make it next week. Mike, CJ, Becca, Cristi, and myself. Editors note: Paddlers should be 'on the water' at 5.30. Great little trailers now available at SC&K. If you are looking for a quick and easy way to transport your boats, these trailers are well worth a closer look. 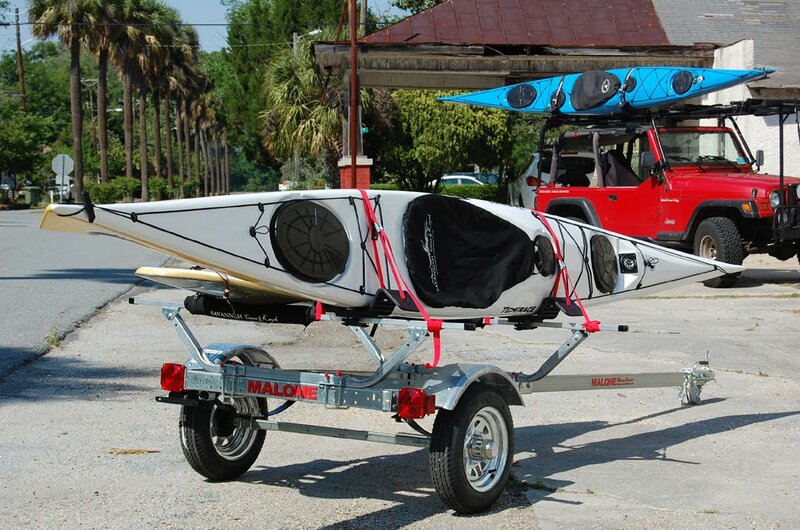 With a comfortable 4 boat carry capacity and light weight design, it makes for an easy haul option to the beach. Basic trailer package starts at $1200. Contact us here for more info. 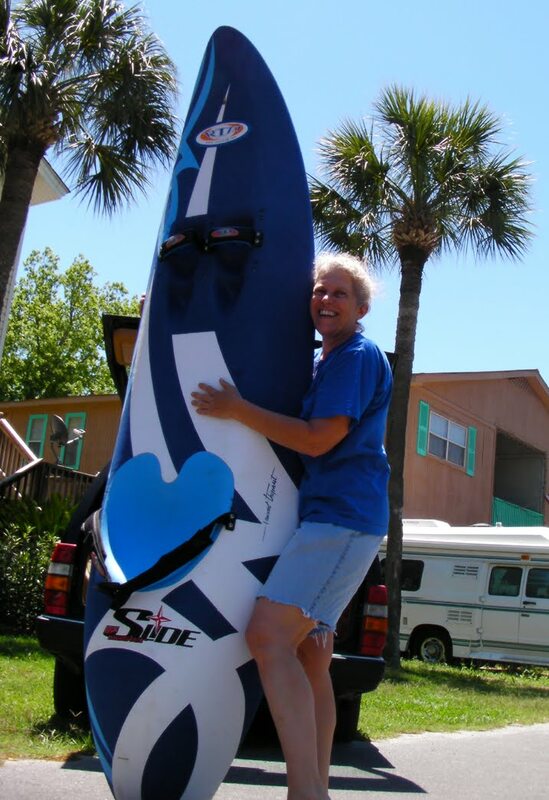 After several sightings yesterday on Tybee Island, Anna was reunited with her wave ski, which was stolen from her home six weeks ago. Mike R of Saltwood Paddles was leaving the island after the Sunday morning surf session (conditions were poor due to strong NW winds). On the causeway, he saw the distinctive kayak strapped to a roof racing past him towards the beach. He called it in to Anna. Then, moments later, Ronnie K at SKG saw the same car pass by. He jumped in his truck and gave chase, but lost the perpetrator in downtown Tybee. By this time Anna was out scouting the south end and soon came across the car and wave ski parked outside the Chapel by the Sea. The cops were called and the suspect vehicle was surrounded. The Ski was retrieved without a struggle. 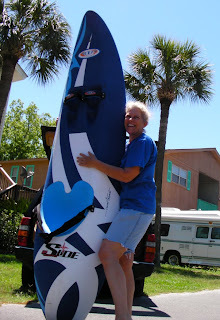 We reported in late March on the theft of the surf kayak. A few weeks later, we received a tip off from a customer, Joseph H, that he saw the board in Play It Again Sports! Unfortunately the board was sold just before Anna could get there. Play it Again were at first helpful, but would not reveal to whom they sold it. They paid the desperate junky thief and his girlfriend $100 for the kayak and then re-sold it for $400. PIAS told the Police that they sold the kayak for cash and had no way of tracing the buyer. As it turned out, the buyer was a cop and he paid with a debit card. So there you have it... a sad story of unfortunates casting a whole lot of bad vibes in the world. Anyway...surf's up and the waters are a balmy 72'. 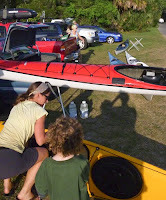 Thanks to the keen-eyed kayak community for getting this one back! a look at this and seeing if you can help! girls are 1st and 5th graders at May Howard. knew we lived on Tybee and thought I might know someone. contact Anna at the #'s or e-mail below...as soon as possible. Life Renewal on Tennessee Ave.
Not long after Joey's passing we came across this Cardinal nest in one of our Camellia bushes. 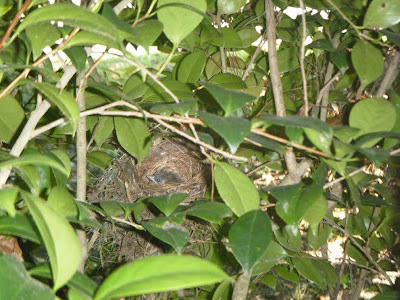 There were three little chicks until yesterday, when two flew the nest. This little guy left today. but do not want to race, we are looking for a few extra paddlers. To prevent racers from taking the a wrong turn in the marsh, we need race course marshalls in kayaks. No better job than sitting in the marsh pointing the way. We also need some seasoned kayak rescue boaters for the front side of Little Tybee. This is a great place for possible surf action rescues and helping with re launches from the beach. Many East coast towns have a strong connection with the Atlantic, either through fishing, naval or maritime heritage. If Little Tybee Island is known for anything, and it's not known for much, it is it's great kayaking environment. 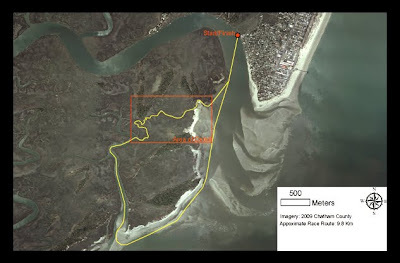 Tybee Island is an island for Sea Kayaking. It's been described as the best kayak race on the east coast, but many have never heard of it, let alone taken part. So what is it that makes The Little Tybee Challenge a 'cult' classic ? Well, firstly, it starts and finishes in a bar. Aj's Dockside has been hosting the event for almost all of the races 12 years. Racers and non racers alike are out in force for a great community gathering on the water. In distance, it's a short race, but this can have little bearing on the outcome. In an area with the second largest tidal variant on the US east coast and constant shifting sandbars, and breaking waves, distance is irrelevant. This is a race against nature. 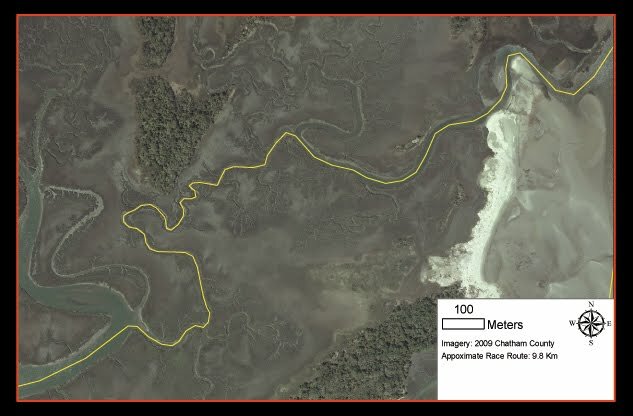 The course takes the racer through the heart of a wilderness barrier island, striking in it's simple beauty. There is nobody roadside to cheer you on, just the cool breeze rustling through the grass. Racers can and do get lost. With a maze of tight creeks and switch backs, even return racers have taken a wrong turn and lost their lead position. Long, fast surf skis and outrigger canoes fair poorly through Jacks Cut. One quarter of the race is on the open ocean. The course takes racers through two shoal areas with breaking waves. If the wind is blowing, the surf is up and many a overconfident racer has been 'washed ashore' trying to cut distance on the 'inside'. course here and your winning margin will slowly be whittled away. You can see the finish line (the bar) and almost hear the crowds cheering. You can hear the paddler behind you, slowly climbing onto your wake, as your muscles and pride burn through your soul...or not. And then it's over, a mere 1 and half hours after it began. And everybody gets a cool prize, a beer and a bowl of gumbo. Did we say it was a 'classic' ? Editors Note: There are three races altogether on the morning of June 12th. 1/Across the river, 2/down the river and 3/around the island. Thanks to Mike Robinson of Saltwood Paddles for the photos. for what has been described as the best little kayak race in the Southeast... The Little Tybee Challenge! 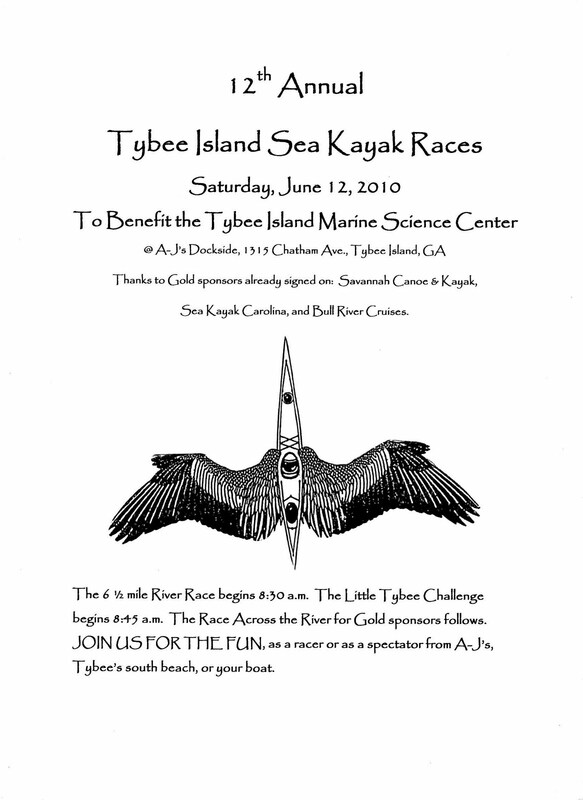 The races are a fund-raising event for the Tybee Island Marine Science Center. The Marine Science Center has been providing interactive marine education to children and adults alike for over twenty years. As you know, the Marine Science Center on Tybee is crammed into a small and outdated space. Plans are afloat to upgrade the infrastructure and increase the education programs, completely relocating the facility to a purpose built center on the more peaceful north end of the island. For Race Day, apart from competitors, race course marshalls and safety boaters are needed for on-water assistance. Volunteers are also needed to help set up and break down the event. For more race info and to download an application for any of the races click here .